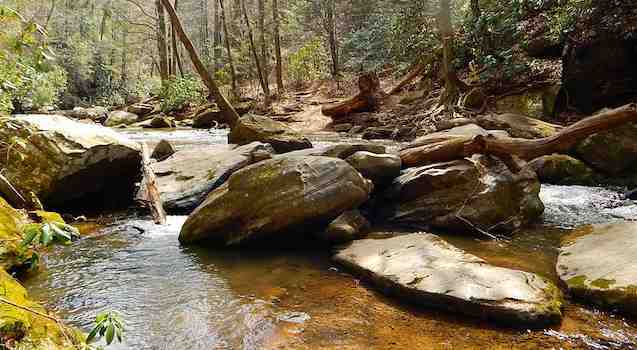 Hiking Highlights: This hike to Big Bradley Falls Saluda, NC follows Cove Creek which is a beautiful fast flowing, rocky creek with crisp, cool water — perfect for cooling off in warmer weather. It’s an incredibly peaceful walk as you hear that amazing sound of the creek almost the entire time. The hike offers one 60 foot wide stream crossing and a small waterfall to the right of the crossing point. The obvious highlight is the 90 foot high waterfall that is Big Bradley Falls and the views surrounding it. The fall drops into a narrow gorge with steep surroundings – this makes for spectacular views. Map & Directions: To Big Bradley Falls Saluda, NC — From the Lake Lure Beach: Take US 64-E to NC 9-S. Travel 6.6 miles on 9 to turn right on Garret Rd. (small Lake Adger sign on Right and Red roof buildings on left) Follow Garret Rd. to end (1.3 miles) and turn right on Silver Creek Rd. 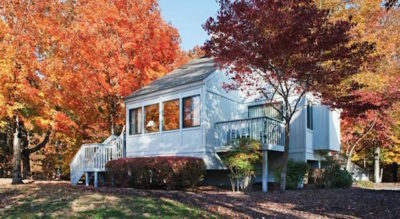 Go 1.6 miles and turn left on Holbert Cove Rd. Drive 6.2 miles to dirt pull-off on right side of the road. Trail Challenges: This is a tricky one. People have been badly hurt and several fatalities have occurred. So – the first obstacle is the 60 foot wide stream crossing. Mike likes rock hopping – but this can be dangerous. Our group of four all did the rock hop across while others simply wade the 1-2 foot deep stream. But, based on your height and jumping/balancing abilities this can be more difficult. Next – to get to the falls viewing points, you must descend the ridge. The descent consists of washouts and tree roots. Be careful and use the tree roots to your advantage (foot holds and grabbing points). The biggest challenge is the 25 foot rope descent that takes you to the base of the falls. This descent is where most of the real problems have occurred. KNOW YOUR LIMITATIONS. Dog Friendly: Yes – however, I personally would not bring dogs or small children to the falls viewing areas – it’s too dangerous. Our hiking rule-of-thumb is to always hike it first before bringing our dogs. Amenities: Good parking area at trailhead – that’s it. 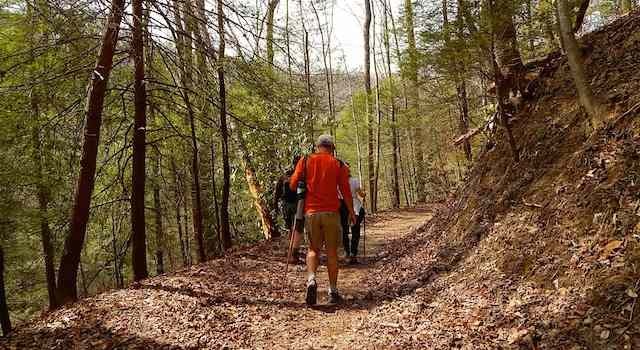 The Hike to Big Bradley Falls Saluda, NC: From the main parking area, enter the trailhead going north. You will cross a tiny creek then notice the trail splits in front of the meadow. If you head left, you walk through the forest canopy – head straight, you go through the meadow – both routes end up at the same place in 100 yards. Continue on about 300 yards and you will see a WARNING sign on a tree to the right of the trail. This is right before you get to the stream crossing and a pretty little waterfall. Your choice: rock hop or wade. Once across Cove Creek, head left and follow along Cove Creek. Continue on the main trail about half a mile and you will see an obvious side trail. This side trail takes you down the ridge to the top of the falls. 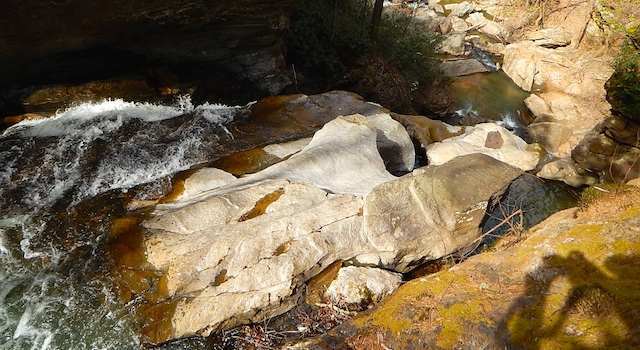 You can climb down the rocks right to the waters edge and the drop – BE CAREFUL! Hey – hopefully you noticed half way down this side trail that there is another side trail to the right. That side trail takes you to the “Ropes”. Two ropes are in place to allow you to grab hold and descend 25 feet to the trail below – it’s up to you – again – KNOW YOUR LIMITATIONS! 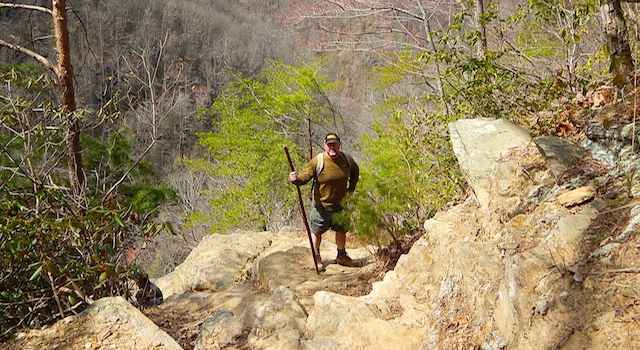 Once down, this trail takes you to the base of the falls and along Cove Creek. If you go to the base, realize that the only way out of the gorge is back up the ropes. Exit this side trail the way you entered. Once back to the main trail, take a left. Continue on the main about 300 yards and you will notice another descending side trail on the left. This side trail takes you to a rock outcropping that looks across to the falls – a gorgeous view! The rock outcropping sits about 200 feet above the gorge below and approximately 150 yards across from the falls – Breathtaking! Head back the way you came in. And as always, please do not leave evidence of your travels and above all “Be Safe”! 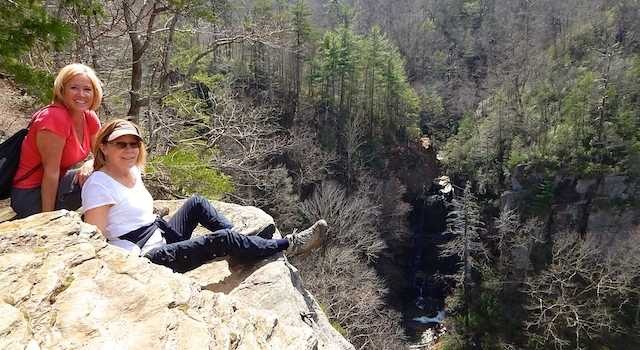 If you enjoy this hike to Big Bradley Falls Saluda, NC then you would also enjoy hiking Little Bradley Falls in Saluda. It is right across the street from the parking area. Read our detailed Little Bradley Falls Trail Review and enjoy. 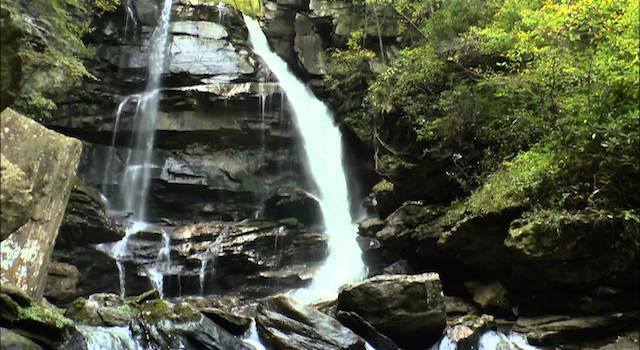 Be sure to also check out nearby Little Bradley Falls — a personal favorite!